FAQ: Can I get a spill berm for a portable light plant tower? I am looking for spill berm for portable light plant tower. I need it to be about 4' x 40' with the ability to pull the light plant right on top of it. Thank you for contacting Portable Tanks, a division of GEI Works. Since you're needing something that can be pulled directly on the berm itself, the best option may be something like a foam wall berm. Unlike some of our other models, the foam wall berm is specifically equipped to handle drive or pull through operations. With these berms, equipment such as the light plant tower can be moved onto the berm directly over the wall. 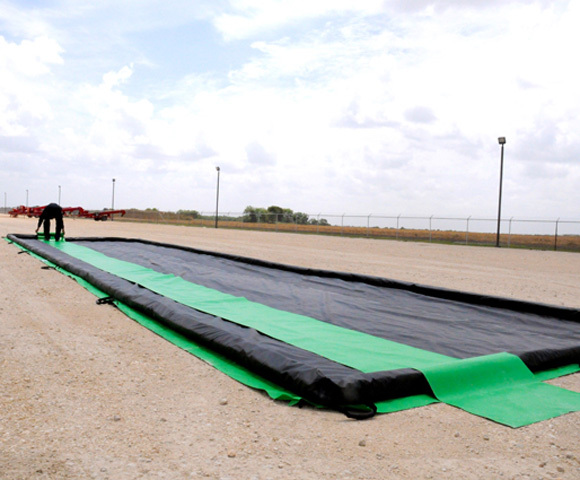 The Foam Wall Berm is the perfect option for applications requiring portable secondary containment. Berms can be driven directly over without causing harm to the wall itself.